"May your brother's legend live on forever"
There may be a lot of bad news and cynicism to be found online, but there are also some touching, uplifting occurrences that remind us of how powerful generosity and kindness can be. 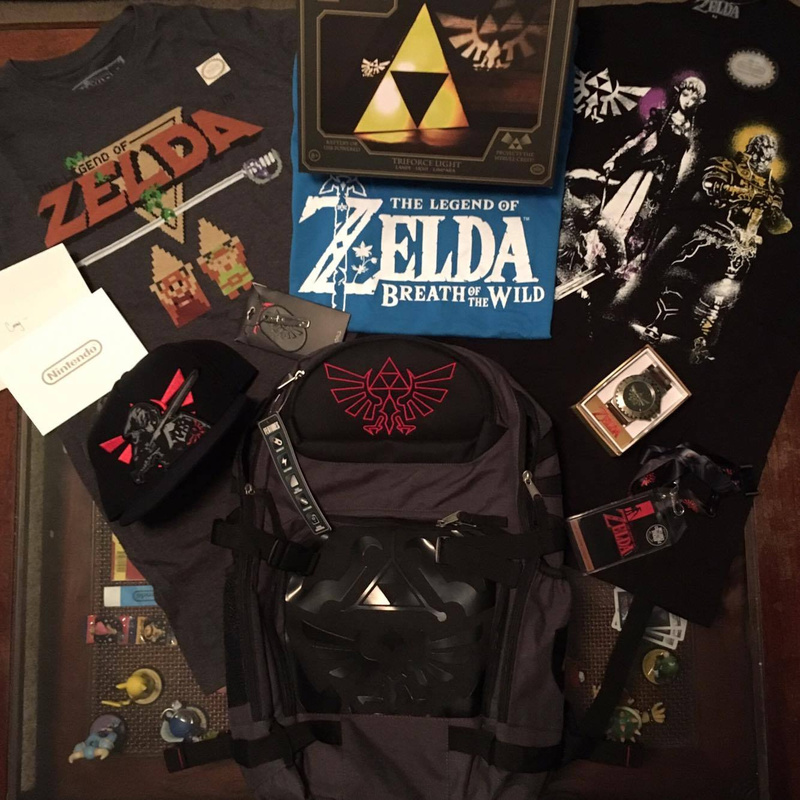 Nintendo, it so happens, has captured plenty of hearts and minds over on Reddit by sending a care package of Legend of Zelda merchandise to a grieving brother. Back in July, Zelda Informer published a heart-breaking article regarding a bond two brothers shared over their love for The Legend of Zelda; Corey Austen lost his younger brother, Matt (just 23 years old), to epilepsy on 31st May 2016. The last conversation the brothers had was about the upcoming E3 event in which Nintendo showed off what we now know as The Legend of Zelda: Breath of the Wild. In the words shared by Zelda Informer back in July, Corey explains his emotions upon learning about the support for the Wolf Link amiibo in BoTW, meaning he could have his brother's save data as a companion in the game. Now, in a lovely touch, Nintendo has sent a care package to Corey packed full of Legend of Zelda merchandise, with a message enclosed. It's an emotional story, of course, and Corey has highlighted - on Reddit - that he's helping run a live stream called MoblinsforMatt to raise money for the Epilepsy Foundation. We wish all of the streamers the best of luck in that fundraising effort, and naturally share our best thoughts and wishes with Corey and his family. Read this yesterday on GoNintendo. It was a really nice, thoughtful and classy gesture by Nintendo after such a sad death. I know the pain of losing a sibling all to well. May his brother's legacy live on forever. Thank you for your support Nintendo! I'm not even being sarcastic. This was a really nice gesture. And it's touching to think that amiibos can be a vessel for our loved ones' ghost data... erm, so to speak. Lovely gesture, may he rest in peace. Well done Nintendo, well freaking done; now I have more respect for you. Yeah I read the first article back then on Zelda Informer and then saw this one the other day. A really nice gesture from Nintendo without being forced by some absurd fan petition to make a tribute and include as in-game NPC. What happens when Wolf Link dies? Is the data from Twilight Princess a one-time use or does BotW only scan the data? 😢my prayers for that young man and his family. Its official. I'm choked up! Did anyone else...probably about 10 years ago...ever receive a package in the mail from nintendo that gave you a wii remote, wii nunchuck, wii party game and a $25 Pizza Hut gift card and also a special poster that said 'Thank You to One Of Our Loyal Fans'. I'm just curious if anyone else got this??? One of the sweetest gaming-related stories in some time. So awesome of them to do that. I love when people come together and help each other in big ways. And so cool about the Wolf Link amiibo essentially being his brother. Awesome, maybe Nintendo will pay tribute to him in BoTW. But that doesn't stop them from putting flashing images in their games. No. I didn't know what Nintendo was 10 years ago. I will be a life long Nintendo gamer because of the memories of playing Nintendo games with my family I grew up Nintendo, to this day everytime I play a Donkey Kong, Star Fox, or Mario game I think back to the fun I had playing those games with my parents . Ohh that's sad and sweet. I saw this yesterday. It's at the same time both really sad and really sweet. @kenrulei Yes, that is true, but I'm wondering if the hearts resets. Like, imagine if Matt's Wolf had, per say, 15 hearts left when he finished the cave of Twilight. When Corey uses it and Wolf Link loses all of his hearts and dies, does it have 3 hearts the next day or have is it reset to 15? 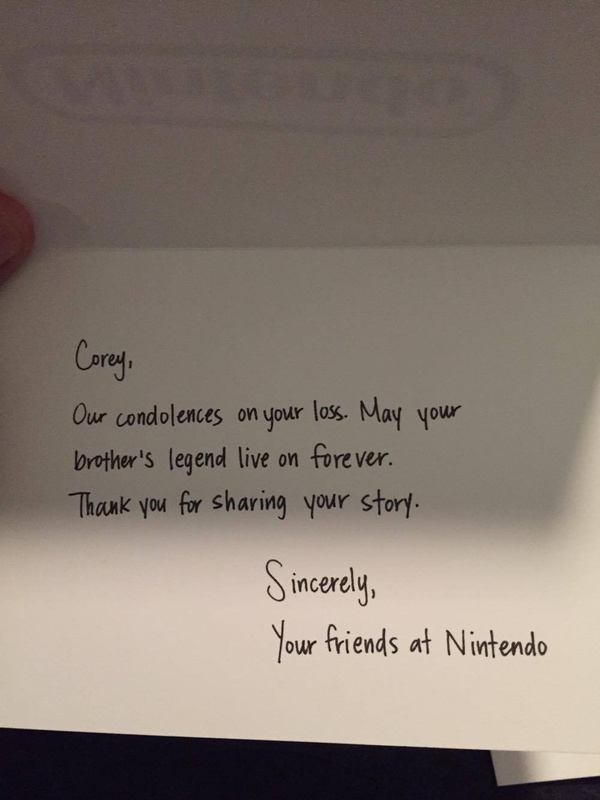 Aww very sad but touching gesture from Nintendo. Never say Nintendo doesn't care about their fans. A touching story, and a classy deed by Nintendo to support a fan whose existence probably has very little influence from which they could use to potentially gain sales, too. I hope it does gain them sales, however, and I hope this continues to get more exposure, that the humility and care shown here becomes more widespread from the games community and industry alike. May the Spirit represented by the Triforce of Courage guide this man and his family through the coming years. Listen, don't kid yourself, Nintendo like any other firm only care about the green. This was merely done from a PR standpoint. It's the least they could do judging from the way they've treated their fans lately. Touching but sad story. Nice move from Nintendo. Nicely done, Nintendo. Nicely done indeed. This is really moving. I agree with @Tempestryke and @Allspice, it's both sad and sweet. I think it should be obvious Nintendo isn't like most of the other companies, "caring just about green." You're just trying to force-feed a cynical worldview. It's not working. That was a nice gesture by Nintendo. @The_Dude_Abides Way to try to turn something heartfelt into cynicism and another forum post to comment with your disdain for Nintendo. @The_Dude_Abides And if the guy never posted about the package? This isn't a PR move. Nintendo is made of people who have feelings. @The_Dude_Abides Oh, brother. Get out of here with that nonsense. There's no need to be a killjoy in this particular comment section. @The_Dude_Abides I hate to be cynical, but I'm going to agree. Im a Nintendo fan, but I couldn't help but think about this being nothing but a great PR move. I don't like the way Nintendo treats their fans. The fact that I'm seeing replies saying even more reasons to love Nintendo shows me that it worked! Reminds me of the time Pixar had an employee show up to blind boys house. He didn't have very long to live. His last wish was to see Up. The movie hadn't come out yet. So the employee goes to his house with Up merchandise and a copy of the movie. I think one of the boy's family members described to to him as the movie played. He passed away not long after. It was a touching story, but I knew the main reason why it was done. Man that really got me, I have a brother &, well I couldn't imagine losing him. A lovely gesture by Nintendo, thanks for sharing this story. I can't find the source for it now as it's been some time. On the topic: that's a really hearthwarming story. A suprising gesture from Nintendo, but nice and kind nevertheless. Okay, whose chopping up onions around here? Seriously though, this is a pretty awesome thing for Nintendo to do. Probably one of the best IRL stories I've read on the internet lately. I hope that charity event goes well! Evil Nintendo at it again eh? Doing evil things dreamed up in their villainous hearts. @outsider83 I honestly believe that when people arrive at this type of conclusion, it shows how inexperienced in life the person who came to that conclusion is, and that they probably base the majority of their worldview on the superficial lessons they've learned from watching too many movies and tv shows. Believe it or not, giant corporations aren't run by robots, they're run by actual human beings, who are perfectly capable of making sensible decisions based on compassion and empathy. This is so poignant and so awesome. a) A company X's employee sees the story online/magazine/Tv or wherever. b) Talks to some of his coworkers about the fact. c) One of them gathers enough courgae, goes to his/her supervisor with the story and an idea of how they can help. d) The manage usually greenlights the idea because it means peanuts from a miscellaneous budget the keep for stuff like this. If I'll be working on Nintendo, I'd have done this out of my pocket. @outsider83 We'll in all honesty, we can't say for sure if this was a PR move. Therefore, we shouldn't just assume it was. I think those who believe this particular action was done for the sake of sales have probably been thinking a bit too much about Nintendo's business transactions lately, that they forget behind the brand there's actually people with real feelings. Just like the feelings Cory has for his brother. What about all the other kids that have similar stories. And the stuff he got looks like the stuff at Gamestop that no one buys. Just a bunch of junk that will be collecting dust soon enough. They should have sent him a letter and then when it comes out a signed NX and copy of the game by Aonuma. A truly one of a kind item. The story is based on a YouTube comment by 00WARTHERAPY00. @outsider83 I can see that perspective and it does happen as a by product because everything in most people's lives of any significance is shared online with others. However, people tend to forget that real people work at these companies and it would only take one or a group of them to be moved and do this. Everything nice done for someone else doesn't have to be to make a company or a person look better. It is hurtful to ourselves to carry that sort of cynicism and negativity around. The chance that this was done just as a nice gesture is even more possible than the one that it was done for good publicity. @Radbot42 Dunno about all of the items, but the BotW shirt he got is an E3 exclusive. Not exactly something "at Gamestop that no one buys." Gaming can help with grief. Our K8 is always the mayor of the town in Animal Crossing, the heroine in Rune Factory games and the farmer in Harvest Moon, now SoS. She's been gone 11 years this November but it lets me feel close to her. It may seem silly, but it helps. @ThanosReXXX yeah reminded me of that story as well. games have come a long way. heartwarming story, this. That was very nice of the guys working at Nintendo. My condolences to the his family. Proud to be a Nintendo & Zelda fanboy after reading articles like that. Thank you NL. @outsider83 It wasn't a BLIND BOY. It was a girl with cancer who's eyesight got worse during that viewing of Up and she didn't have long to live. Also, Pixar never told this story to the presses to promote the film. They remained humble about it. If you're going to be cynical, don't be an idiot and completely neglect research for your own selfish reasons. The fact you were completely inaccurate proves it's pretty clear you don't "know" anything about the context about why the guys at Pixar did that. Also, people are commenting positively because we care about other human beings and not just what the Nintendo staff did. Most important thing is that our loved ones are still with us as long as we keep remembering them, so good on you. And a nice way to do it as well, putting her in your favorite games and all. That is so cool. So many people forget that a company is made of people. And that while not all of them, many of them are average folks with famlies and lives and empathy for others. I imagine that many who work for Nintendo do so out of love for how Nintendo's products have impacted them and thus it doesn't surprise me that Mr. Austen's story prompted such a response. As much as I hate fanboism and company obsession I can't help but be in awe and appreciate the Impact a company, its products and the people that make up said company can have on so many. I can firmly say that the Zelda series saved my life as a child so I am so happy to see that it may give some form of comfort to Mr. Austen as well. I wish him peace and good health. sad story and good job nintendo. "It was so unreal. My brother and I could still play the new game. Together." That got me. It's awesome that his brother will basically be playing with him in spirit. Even if he can't be present physically. A great act from Nintendo, sorry for the death of this boy. Very good form, Nintendo. So sad. I completely lost it at the Wolf Link Amiibo part. I couldn't believe that Nintendo did this. Then again, they've always cared more about their fans more than money. @ThanosReXXX Dang it, I'm crying again. This is so sad but really touching and sweet. Poor guy, I should donate to the epilepsy foundation. Rest in Peace Matt. I'd be lying if his story didn't make me a little misty eyed. My condolences to his family. I too was thinking about making some kind of donation to the epilepsy foundation. Such a classy and sweet thing to do on Nintendo's part. The HM games were her favourites, too. Caitie got me hooked on Friends of Mineral Town and the others. I love the games that have let you really personalize the character as it adds to the experience so much. My girl can run around in Fantasy Life in all her purple-haired glory. She'd have LOVED that game. @k8sMum I never really got into Harvest Moon. I do have the GameCube version of the game, but I hardly played it. Animal Crossing attracted me more at the time. A very heartwarming story... but... did anyone else catch the "amiibos" (plural of "amiibo" is "amiibo")? @KTT The package came from Nintendo Of America...something about downloading many games from the Wii Shop. Remote, nunchuck and game all worked and were sealed...nintendo licensed. Kind of a neat little thing they did...also, wasn't the first time they did something like that. Back in the NES days, if you filled out enough of the warranty cards and sent them back in, you ended up receiving Super Mario Bros 3 for free in the mail...I got that. Capcom and Sega also did this (back in the NES and GENESIS eras). It soon stopped during the PS1, N64 and Dreamcast eras, but there were various companies that did that kind of incentive. PS...not trying to start an argument, if any of this sounded like that, just wondered if anyone else ever got this package too. Oh jeez, there's something in my eye. Why is it that I'm always the one who isn't crying when everybody else is? Oh, that's right. It's because I'm a hardened, sour mofo. @The_Dude_Abides think you've been smoking too much green. @Retruate it always fascinates me when people in the US refer to everyone's favourite man child attracting heavily licenced building blocks as 'Legos'. @JLPick Yep, I received that box in the mail. It was pretty surprising, actually. For me, it was a pink Wiimote, pink nunchuck, some cardboard Mii masks on a stick, a Dominoes pizza giftcard and Wii Party. It said something about getting friends together to have fun on Nintendo's dime. Pretty cool. Same for this story. Really great for a company to reach out like that. Very classy. @KTT No prob. Didn't know it was that bad with nintendo over there...hopefully, nintendo starts doing better in all countries, besides just Japan. @JLPick It's got better over the years. We had no Nintendo support to few distributors, which changed during the years, and I think the current one is doing the better job! Many people still don't know what Nintendo is, but I can see their games and systems in normal stores again, so I hope that with NX, the things move even more and people will stop laugh at Nintendo. @KTT That's kind of the way it is over here in the US. Wii U is almost nothing on the shelves...Toys R Us in my area, doesn't even have anything except the Amibos and Wii Remotes...absolutely no Wii U games, which is kind of sad considering the Wii was dominating the shelves everywhere. Just like you, I hope the NX does great and nintendo is back on the map again...it seems weird that they're not even considered in the console race for this generation.